Westshore students, WINTER IS COMING! 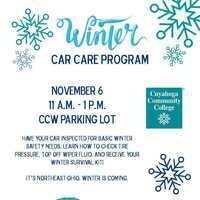 Have your car inspected for basic winter safety needs, learn how to check tire pressure, top off wiper fluid, and receive your winter survival kit. Contact the Student Engagement Office with questions at 216-987-5929. Car care program is an amazing initiative and I want to a part of it. I can help people from Colorado by checking their car's VIN at https://www.faxvin.com/vin-check/colorado. I believe that it will be a big part of this program and will help people to feel more safe about their car not being a stolen one.